What Should I Know about Wounds and Wound Care? There are many types of wounds that can damage the skin including abrasions, lacerations, rupture injuries, punctures, and penetrating wounds. Many wounds are superficial requiring local first aid including cleansing and dressing. Some wounds are deeper and need medical attention to prevent infection and loss of function, due to damage to underlying structures like bone, muscle, tendon, arteries and nerves. The purpose of medical care for wounds is to prevent complications and preserve function. While important, cosmetic results are not the primary consideration for wound repair. Animal and human bites should always be seen by a medical professional because of the high rate of infection. It is important to know a person's tetanus immunization status (for example, has the person had a tetanus shot or booster vaccine in the last 5 years?) so that it can be updated with a tetanus booster if needed. The skin is a large sensory organ that interacts with the environment, and sends signals to the brain about touch, pain, vibration, and position. There are two layers of skin that cover the body, the epidermis and dermis. Keratinocytes are the main skin cells that we see. New epidermal cells begin where the epidermis and dermis meet. These cells gradually mature and rise to the surface of the skin and are eventually shed to be replaced by new ones. The epidermis has no blood vessels and receives nutrition from the underlying dermis. Melanocytes contain pigment and provide coloration to the skin and are responsible for absorbing radiation and protecting against the damage caused by ultraviolet radiation. Langerhans cells are made in the bone marrow and migrate to the surface of the skin and help fight infection. Merkel cells are specialized skin cells that help with sensing light touch. They are located on the tips of fingers and toes as well as other specialized areas. The papillary dermis is a thin layer of tissue located just beneath the epidermis and contains capillary blood vessels and a few elastic and collagen fibers. The deeper reticular dermis contains large bundles of collagen and elastic fibers that run parallel to the skin surface. The collagen and elastic fibers are responsible for helping the skin resist injury from shearing or other types of trauma, and allow the skin to return to its resting state after being stretched or compressed. 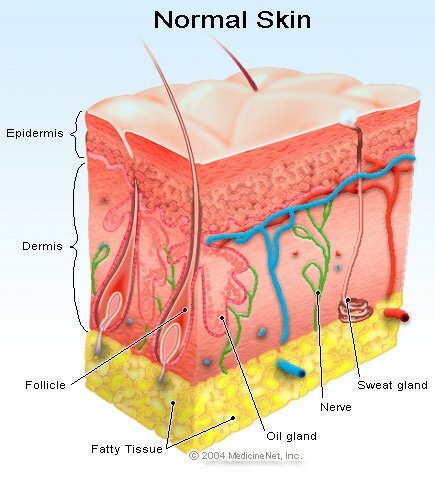 This is the layer where hair follicles, sweat glands and sebaceous glands are found. Subcutaneous fat tissue underlies the layers of epidermis and dermis and provides extra cushioning for the skin. Beneath this layer lie muscle and bone. Inflammation is the skin's initial response to injury. Proper wound care is necessary to prevent infection, assure there are no other associated injuries, and to promote healing of the skin. An additional goal, if possible, is to have a good cosmetic result after the wound has completely healed. This wound care article is designed to present information on wounds involving mainly the skin; it is not meant to cover all wounds (for example, gunshot, degloving wounds, tendon lacerations, and others). The most common symptoms of a wound are pain, swelling, and bleeding. The amount of pain, swelling, and bleeding of a wound depends upon the location of the injury and the mechanism of injury. Some large lacerations may not hurt very much if they are located in an area that has few nerve endings, while abrasions of fingertips (which have a greater number of nerves) can be very painful. Some lacerations may bleed more if the area involved has a greater number of blood vessels, for example, the scalp and face. The wound is due to significant force or trauma and other injures are be present. Bleeding cannot be stopped even with persistent pressure and elevation. There is concern that wound requires repair with sutures (stitches). The size and location of the wound are important considerations. Most facial wounds may need to be repaired for cosmetic reasons, especially if they involve the lip or eye. The wound is caused by an animal bite. There is also a need to consider rabies immunizations, if appropriate. The wound is very dirty and cannot be easily cleaned. There is evidence of infection including redness, swelling, increased pain, and pus at the wound. Tetanus immunizations are not up to date, then a booster is needed within 48 hours. If the patient has never been immunized, the initial tetanus prevention with immunoglobulin should be given immediately. X-rays may be taken to look for broken bones (fractures). X-rays may also be helpful in looking for foreign objects that may have been embedded in the laceration. Fluoroscopy done at the bedside may help find foreign bodies that are deeply buried. Ultrasound may also be used to assist in diagnosis of foreign bodies in the wound. Fluoroscopy and ultrasound are only available in the emergency department and hospitals. Most wounds may be cared for at home. Superficial abrasions and lacerations can be cleaned, an antibacterial ointment applied, and then covered with a Band-Aid or light bandage. Often, bleeding can be controlled with direct pressure to the wound, and if possible, elevating the bleeding site above the level of the heart. This allows gravity to help decrease blood flow to the injury. Most bleeding will stop within 10 minutes, at which point, a dressing can be placed over the wound. If bleeding is not a problem, the wound can be cleaned using tap water to wash out any debris to decrease the risk of infection. River and lake water can contain many types of bacteria that can cause significant infection. It is not recommended to clean wounds with contaminated water. Deeper wounds are painful and scrubbing is not necessarily advised. If a wound needs medical care, there are steps that can be taken at home to begin treatment. 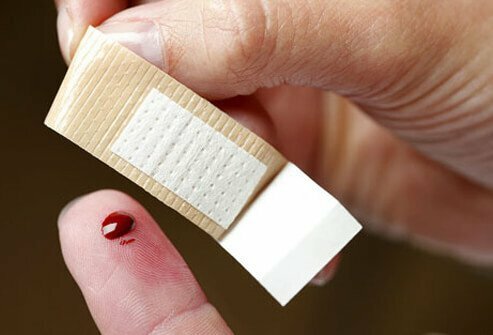 Unless there is a significant underlying injury, there is ample time to seek medical care and it is appropriate to take a few minutes to clean and dress the wound. The doctor will make certain that there is no associated injury with the wound (for example, if a person falls on their chin, they may be at risk for a jaw fracture), and that the risk of infection is minimized. Good cosmetic appearance with a thin scar is also a goal, but it is not necessarily the most important goal. History is important to understand the circumstances of the injury, because mechanism of injury will significantly affect the care provided. An animal bite will require more medical care than a fall on the playground. It is important to know the circumstances of the injury to decide how dirty the wound might be, and whether there are any potential underlying injuries. People with diabetes, poor circulation, on dialysis, or taking medications that can compromise the immune system are at higher risk of infection; and the decision to repair a wound may be affected by the patient's medical history. Tetanus immunization status will be required to determine if immunization is required. The time frame from when the initial injury occurred, and when medical care is sought is also a consideration. The longer a wound is left open, the higher the risk of infection if it is sutured. The guide for many health care practitioners is between 6 and 12 hours. If the wound is older than 6 to 12 hours, it may not be sutured. Lacerations of the extremities including legs, arms, feet and hands may involve tendons, nerves and arteries. Assessing their function is an important part of the physical examination. Primary closure: The health care professional will clean the wound and then explore the area for foreign bodies or underlying structures that may have been damaged prior to closing the wound with sutures, staples, or surgical glue. If the wound is too old, too dirty, or if there are other reasons to believe that closing the wound is inappropriate, healing may occur by secondary intention. The wound will be cleaned, dressed, and allowed to heal gradually over time without sutures. In otherwise healthy people with potentially dirty wounds, a combination of the two techniques may be considered (secondary intention and then primary closure). In this scenario, the health care practitioner will clean and dress the wound. The patient will be asked to return within 3-5 days, and if the wound shows no evidence of infection, it may be closed with sutures, staples, or surgical glue. Physiologic dressings such as Tegaderm or Hydrogel may be used to promote healing instead of suturing in the elderly due to their very fragile skin, which makes it difficult to repair lacerations and tears in the skin. If a wound is cleaned and cared for properly, there is often little need to prescribe antibiotics. However, animal bites, human bites, wounds exposed to river or lake water contamination, or other significantly dirty wounds, poor circulation may be prescribed to prevent infection. Antibiotics may also be prescribed if underlying structures like tendons or bones are involved. The prognosis for wound healing is individualized and depends upon the type of wound, the underlying injury, and the baseline health of the patient. Most minor wounds including simple lacerations and abrasions heal on their own and do not require medical care. The more complicated the patient and the more complicated the wound, the prognosis for a perfect outcome decreases. The goal for all wounds is to have healing that allows the return of the injured part to normal function. Outcome also depends upon the risk factors present. Wounds that are contaminated and very dirty are more likely to become infected, and heal poorly than those that are not. Wounds tend to heal with less success in individuals with poorly controlled diabetes or who have poor circulation. All lacerations will leave a scar but the health care practitioner will work to minimize the thickness and appearance of scars. Accidents happen and most people will sustain a wound regardless of how careful they might be. It is important to remember that when using tools at home or at work, to make certain they are being used in the appropriate manner and the appropriate precautions are taken. Often accidents occur because the person was in a rush, took a shortcut, or was using a tool in a way it wasn't designed. Protective gear is always appropriate. Wearing proper shoes or boots, wearing a bike helmet, or eye protection regardless of the situation will prevent an injury. Stitching or suturing, is the most common form of treating and repairing a wound. Other methods include surgical staples, skin closure tapes, and adhesives. Removing stitches or other skin-closure devices is a procedure that many people dread. Understanding the various skin-closure procedures and knowing how they are put in and what to expect when they are removed can help overcome much of this anxiety. Tintinalli J, et al. Tintinalli's Emergency Medicine: A Comprehensive Study Guide, 8e. McGraw-Hill Professional. What treatment was the best for your wound care?